Have You Seen His Grades? You completed a tutorial level. You unlocked Eddie's Frankenstein guitar. You created a custom tattoo. You completed the career intro. You completed a career on Beginner. You completed a song with the full band. Your band hit a 50 note streak at the same time. Your band hit 100% of the notes in a song. Your band activated Star Power at the same time. Your band earned an 8x multiplier at the same time. You unlocked all of the Van Halen instruments. You completed a gig in West Hollywood. You completed a gig in Dallas. You completed gigs in London and The Netherlands. You completed gigs in Los Angeles and Rome. You completed a career on Easy. You completed all Van Halen songs. You completed gigs in Berlin and New York City. You unlocked all Van Halen characters. You completed a career on Medium. You completed a career on Hard. You completed the majority of the gigs. You completed a career on Expert. You completed a drum career on Expert+. You got 5 stars on 'Little Guitars', 'Cathedral', 'Spanish Fly', and 'Eruption' on expert guitar. You collected 5 stars on every Van Halen song while playing bass on Expert. You collected 5 stars on every Van Halen song while singing on Expert. You collected 5 stars on every Van Halen song while playing drums on Expert. 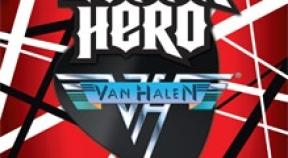 You collected 5 stars on every Van Halen song while playing guitar on Expert. You completed every Van Halen song on every instrument. You completed the song 'I Want It All' as Eddie playing guitar. You won a guest artist song playing with Eddie. You won a guest artist song playing with Dave. You won a guest artist song playing with Alex. Can I Borrow a Quarter? You created a custom guitar. You created a custom drum set. You rocked out as classic Eddie. You rocked out as classic Dave. You rocked out as classic Alex. You rocked out as classic Wolfgang. You won a song as a band with Eddie, Alex, and Wolfgang. You performed on every instrument with a member of Van Halen. You scored 800,000 playing 'Hot for Teacher' with your band. You scored 225,000 playing 'I’m the One' on expert guitar. You are now like a Van Halen encyclopedia!